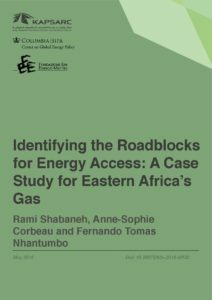 In collaboration with Columbia’s Center on Global Energy Policy and the Fondazione Eni Enrico Mattei (FEEM), this project investigates the potential demand for natural gas in the Eastern African region based on the development of resources in Mozambique and Tanzania, and potentially, Kenya. The countries analyzed include Mozambique, Tanzania, Kenya, Uganda, Malawi, Rwanda, Burundi, Ethiopia and South Africa. The project looks at the best ways to effectively develop gas use in these countries, first by using large anchor customers such as power plants and large industrials, but also investigating the potential for more localized use of natural gas – as currently investigated by South Africa. It also looks at how the regulatory frameworks in the different regions could be improved to promote the development of regional natural gas demand. Moreover, it will examine how regional cooperation initiatives and the pace of development of LNG exports can influence such a development.